Let’s Get Social! Check Out Zoëtry Wellness & Spa Resorts on Pinterest and Instagram! They say a picture is worth a thousand words, which is why one of our favorite things to do is share as many photos as we can with our fans! Whether you’ve visited a Zoëtry Wellness & Spa Resort in the past, are planning an upcoming visit or just love filling your social media feed with gorgeous, tropical photos – we’re here to provide you with your daily dose of Endless Privileges®! Love checking out views like this one from Zoëtry Villa Rolandi Isla Mujeres Cancun? Follow us on Instagram and Pinterest for so much more! Immerse yourself in The Art of Life® at our unique boutique havens. Unrivaled luxury and holistic wellness combine with Endless Privileges® to offer a blissful experience that exceeds all expectations. Each resort features no check-in or check-out times; 24-hour private, in-suite dining; maid service three times daily; a welcome bottle of rum or tequila; and so much more. All for you, all included and only at Zoëtry Wellness & Spa Resorts! One of our favorite social media channels is Pinterest! Follow Zoëtry Wellness & Spa Resorts on Pinterest! Our Pinterest page features tons of great content and photos including our gourmet cuisine, luxury accommodations and beautiful resort grounds! We even have great inspiration for destination weddings, vacation fashion and delicious recipes you can take home to your kitchen after your trip ends! Head over now and get pinning – we can’t wait to see what you chose for your own boards! If Pinterest doesn’t completely satisfy your need for a daily dose of Zoëtry Wellness & Spa Resorts, you absolutely need to check us out on Instagram as well at @ZoetryResorts! #NoFilters here! 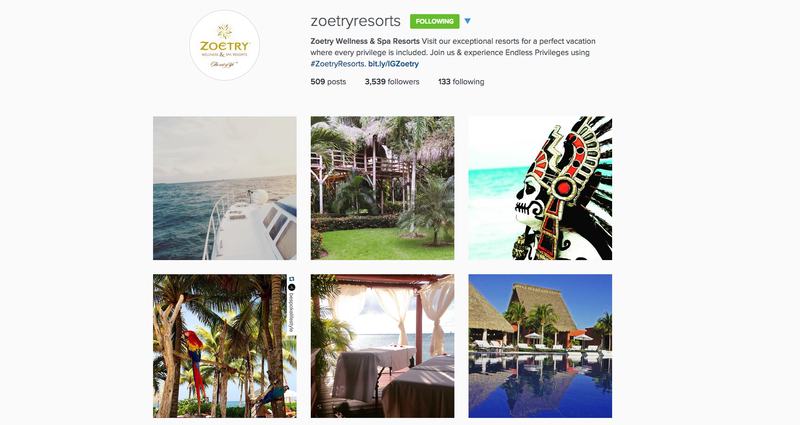 Just gorgeous shots from the Zoetry Wellness & Spa Resorts Instagram! What are you still doing here? You’ve got some great photos to check out! We’ll see you online! This entry was posted in Zoëtry Wellness & Spa Resorts and tagged Get Social, instagram, Photos, Pinterest, social media. Bookmark the permalink. ← Come Sail Away at Zoëtry Villa Rolandi Isla Mujeres Cancun!